After started to silently download and pre-load Windows 10 setup installation files in the background to local systems running Windows 7 and Windows 8.1 who have took the trouble to reserve the free Windows 10 upgrade, Microsoft has begun to notify selected users to upgrade their systems to Windows 10 on the night of June 28th, a day ahead of official general availability date of Windows 10, which falls on July 29th. In fact, the Windows 10 Launch page by Microsoft specified that Windows 10 is coming on July 28th (though it may be just a typo). But the roll out of free Windows 10 upgrade to PCs and computers that reserved the free upgrade does indeed begin. 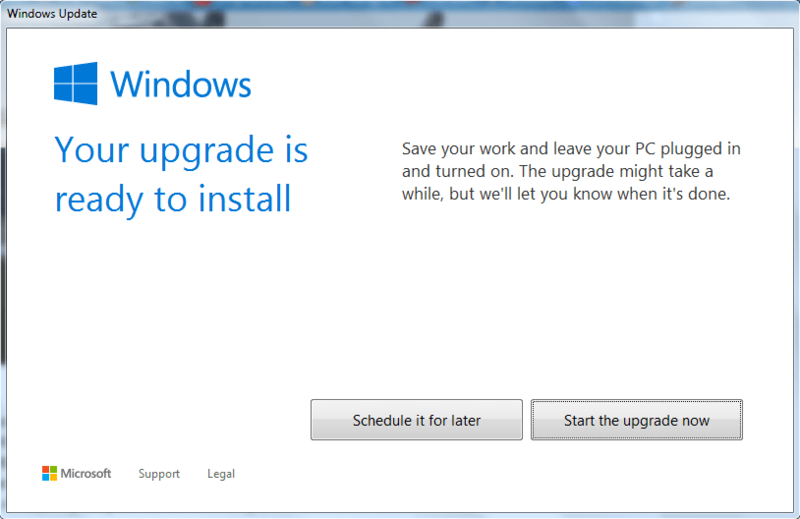 Several users have been prompted by Windows Update that “your upgrade is ready to install” with options to start the upgrade now or schedule it for later. The early birds seem to be those from Asian region, such as China, where the timezone is close or already July 29th. After upgrading to Windows 10 and applying all updates, the Hardware Abstraction Layer in MSinfo shows that the version is 10.0.10240.16392. Apparently the Zero Day Patch (ZDP) or Day One Patch applied automatically in the upgrade process may not be complete and include all the updates released to-date, as user may still need to run Windows Update to apply more updates available for Windows 10. Microsoft has stated that the roll out plan of Windows 10 for the general public would be step-up scaling, where fewer gets it first, and more is getting it as days go by. Thus, do be patient and glad that you’re not “guinea pig” if your system doesn’t prompt you to install Windows 10 now, even though it may have completed the download of Windows 10 OS onto local disk. Windows was unable to locate required installation file [boot.wim]. Verify that the installation source is valid, and restart the installation. Anyway, if you can’t wait, you can always manually upgrade to Windows 10 through Windows 10 ISO images that floating on the Internet without waiting for Microsoft’s GWX push via Windows Update. You must perform in-place upgrade to Windows 10 from existing Windows 7 or Windows 8.1 systems at least once to record the device hardware ID with Microsoft, so that you can perform clean install or reset the system and remain permanently activated. After upgrading to Windows 10, a generic product key which may be specific to the edition, language and/or country is used to activate the Windows 10. Thus, the device hardware ID is the only way to ensure that you have proper Windows 10 license installed on the device, and that Microsoft continues to grant the Windows 10 license to the machine in future. Update 2: Microsoft released official Windows 10 Media Creation Tool to upgrade to Windows 10 or download ISO.